The 2017 NFL regular season is in the books, and while a dozen teams can concentrate on January football, for the rest, all that is left is to look back at the season that was and ahead to the prospect of the draft and free agency. 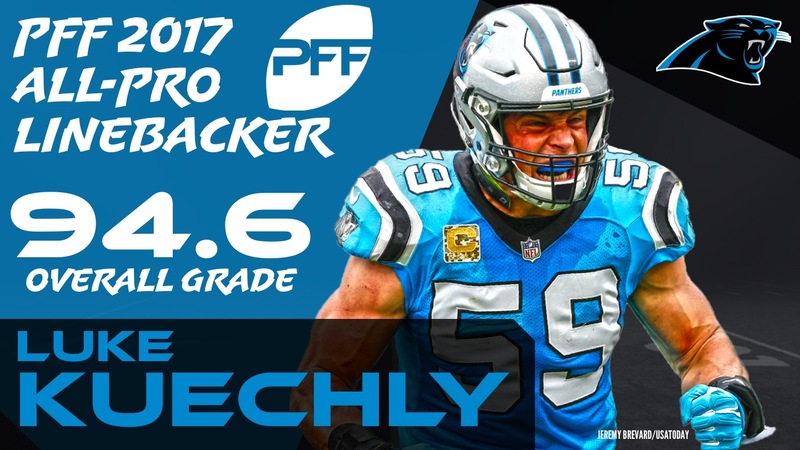 Each year, PFF brings you a unique All-Pro team based on the insights derived from watching and grading every player on every play of the NFL season. This year, we will match the new and improved All-Pro system when it comes to offensive and defensive formation, with a flex player for both sides of the ball that can be either a receiver, slot weapon, tight end or running back on offense and anybody in the defensive secondary on defense. This gives us the flexibility to reward the player that best deserves it across multiple positions, rather than shoehorning in somebody just to fit a slot receiver or cornerback role. Elite Stat: Brady ranked No. 1 in passer rating while under pressure (96.3) among quarterbacks with at least 60 pressured dropbacks in 2017. Tom Brady has been the clear-cut front-runner at quarterback this season despite ending the year on a relative slump. That Brady achieved all this at the age of 40 just adds to his legend within the NFL, and he is playing some of the best football of his career at a time when most quarterbacks are sitting on their couch in retirement. 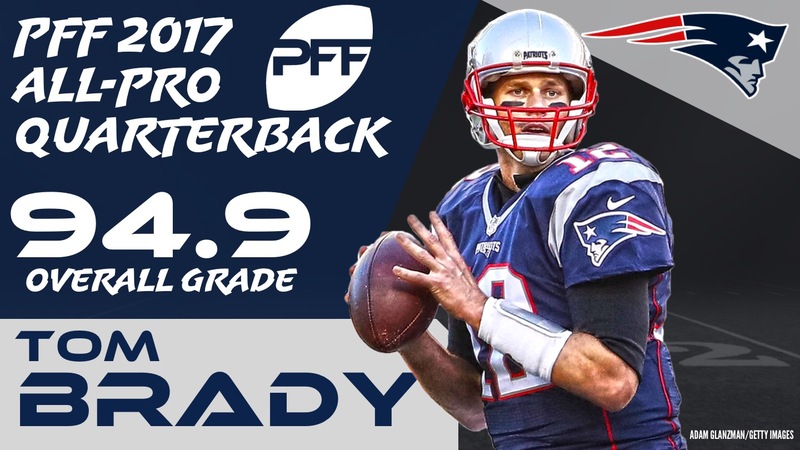 Brady’s overall PFF grade of 94.9 was some distance clear of the next best mark and his second-straight season leading the league. While other passers may have been able to match Brady’s production over portions of the season, when you isolate the throws being made, nobody could match what Brady was doing on a down-to-down basis, even if it didn’t always result in the production it deserved. Elite Stat: Among running backs with at 200-plus snaps in route in 2017, Gurley finished with the third-highest yards per route run at 2.15. No player benefited from the new regime at the Rams and the new offensive scheme than Todd Gurley. 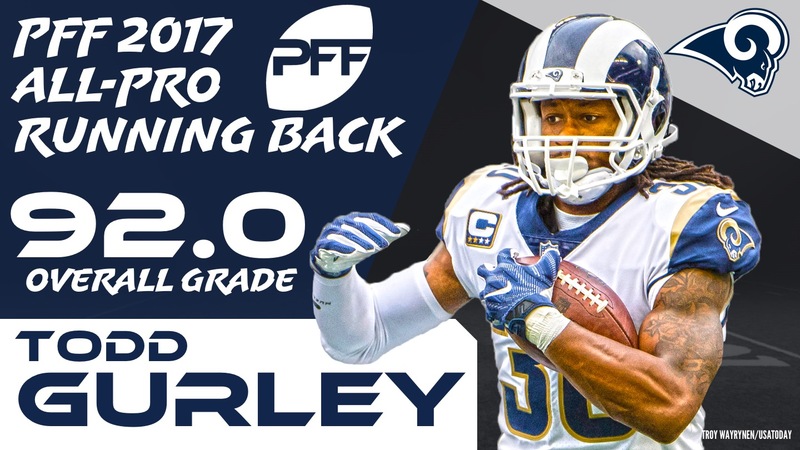 As much of the story for most of the season was how big a step forward Jared Goff had taken from his rookie year, Gurley was the player whose career was rescued from the flames, and he ended the season with the best overall PFF grade at the position, thanks in large part to how devastating he was as a receiving weapon out of the backfield. Gurley gained more than two yards per route run this season, more than 2,000 yards from scrimmage and only missed out on the rushing title because the Rams rested him in Week 17 with nothing to play for. Not only is he our selection for All-Pro at running back, but he has a good case for Comeback Player of the Year as well, such was his turnaround. Elite Stat: Brown averaged 2.87 yards per route run in 2017, which was second only to Falcons’ Julio Jones among wide receivers with 40-plus targets. Antonio Brown remains the class at the wide receiver position. He led the league with over 1,500 receiving yards despite being injured 21 snaps into his Week 15 encounter with the Patriots and sitting out the final two games of the season. Brown’s year was so good he was garnering MVP buzz, one of the rare occasions you will hear that about a wideout. He gained 2.87 yards per route run this season, trailing only Julio Jones in terms of outright production. 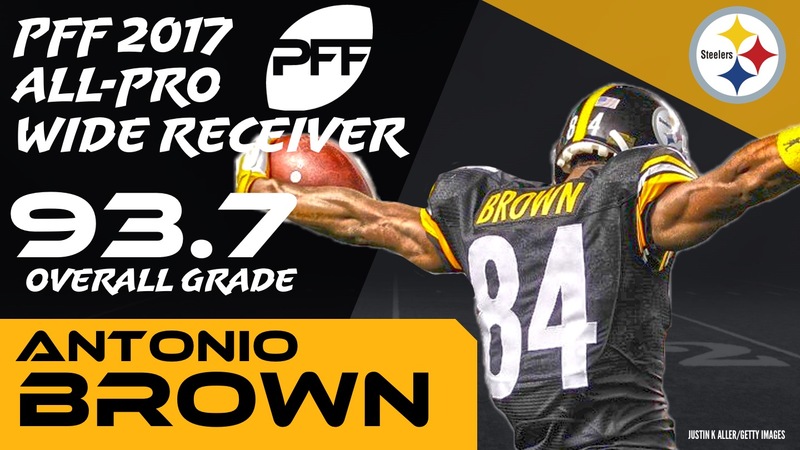 There is no better wide receiver than Brown, who in addition to his production was able to make a series of mind-blowing catches in big situations over the year. Elite Stat: For the third consecutive year, Jones led all qualifying wide receivers in yards per route run, finishing his 2017 campaign at 3.08. In a surprise to nobody, joining Brown as the first team All-Pro wide receivers is Atlanta’s Julio Jones. He led all receivers, at any position, with 3.08 yards per route run. 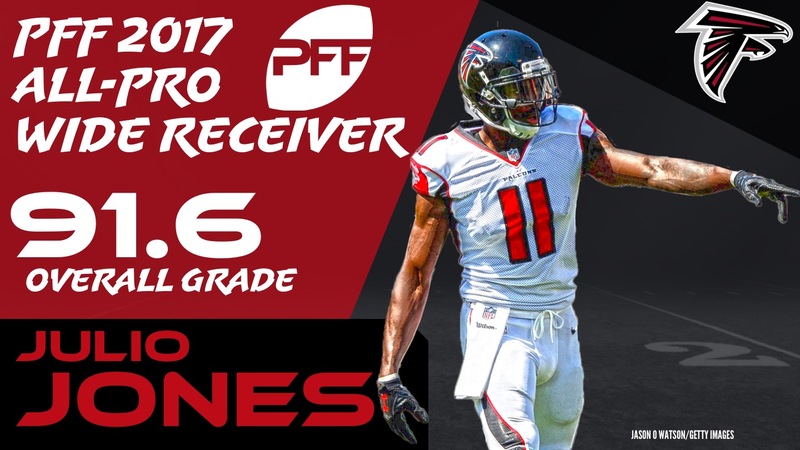 He was the only receiver to gain more than three yards on average every time he was in a passing pattern, and he is the closest thing the game has to an uncoverable wide receiver. Defenses simply have no player that can match up with the physical gifts that Jones possesses, and even elite corners going up against Jones will surrender production and struggle to live with him over the course of a game. Elite Stat: Gronkowski averaged 2.40 yards per route in 2017, outperforming any tight end with at least 29 targets by .35 yards. Another selection that will surprise nobody, Rob Gronkowski just reinforced in 2017 that he is the class of the position and a more dominant force than anybody else out there. He was the player that became the flaw in Pittsburgh’s new man-coverage gameplan in their Week 15 meeting, as the Steelers simply didn’t have anybody that could cover him one on one, and what really separates him is his ability to block as well as factor as a receiver. 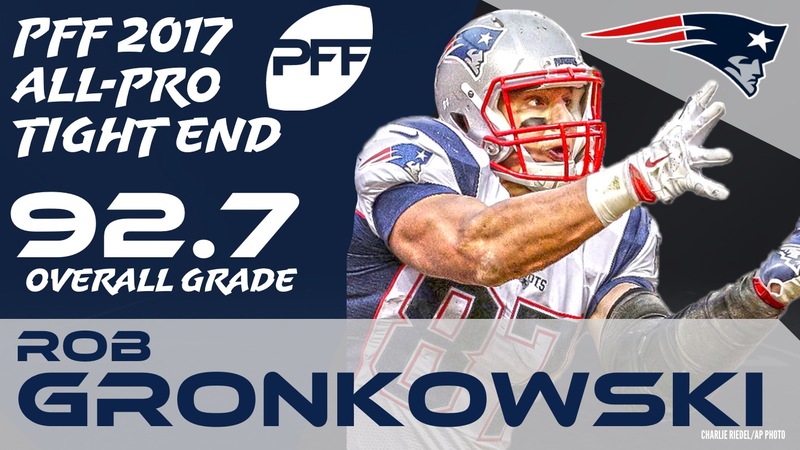 Gronk has by far the highest overall PFF grade in the league at his position, but his run-blocking grade of 84.1 ranks second among all TEs, ahead of dedicated blocking tight ends. That versatility makes him the ultimate weapon at the position and adds a different dimension to players that are simply receiving weapons. Elite Stat: Hopkins averaged 2.39 yards per route run, tying him for fourth among qualifying wide receivers. 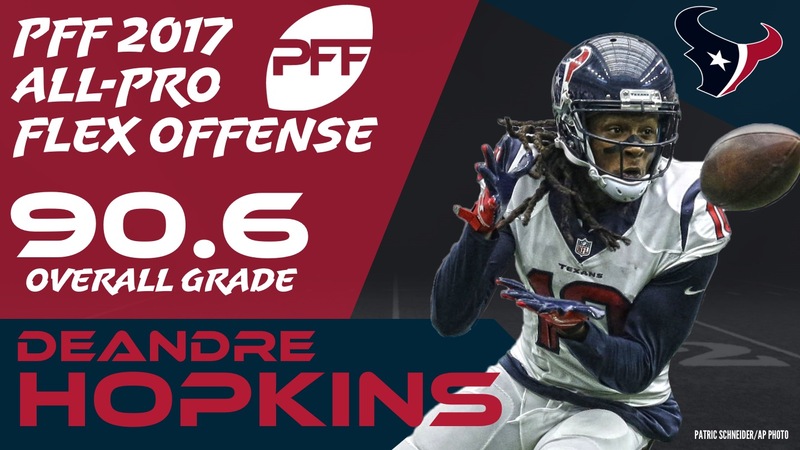 The flex position was a real battle this year between multiple deserving candidates, but in the end, the production that DeAndre ‘Nuk’ Hopkins was able to have despite the situation around him was phenomenal. Hopkins ended the year with an overall grade of 90.6 despite the Texans having the worst offensive line in football and dealing with Tom Savage or T.J. Yates throwing him the ball for half the year. Hopkins gained 2.39 yards per route run and led the league in receiving touchdowns at wide receiver. He was thrown at 164 times, the most in the league. 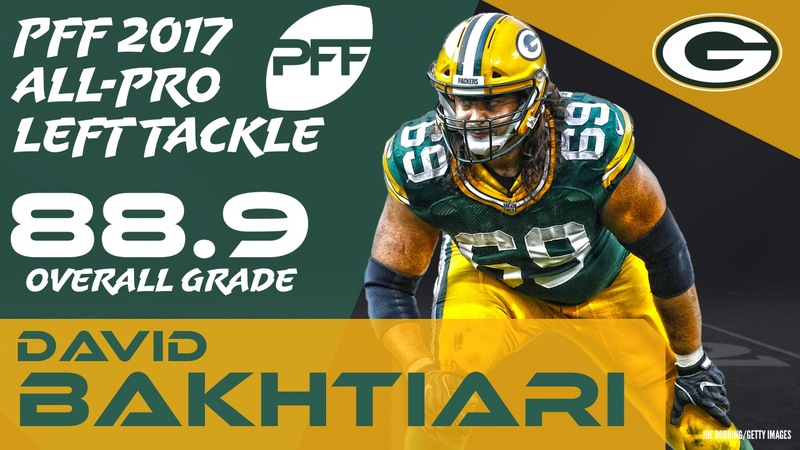 Elite Stat: Bakhtiari led all qualifying offensive tackles in pass-blocking efficiency, allowing just 12 total pressures (one sack, two hits, nine hurries) on 455 pass-block snaps. He may have missed four games through injury, but David Bakhtiari’s performance as a pass-blocker in what is a pass-first league was just too good to ignore. Over the course of the season, Bakhtiari allowed just 12 total pressures, or an average of just one per game. If you include holding penalties as a pass-blocker, as well as blocks beaten by defenders but the ball came out before it could become pressure, Bakhtiari lost just 16 pass-blocking snaps all season, or 3.3 percent of his pass-protection assignments, by far the best mark in the league among tackles and a good mark even for a center – a player asked to block one-on-one less than a quarter as often as a tackle. Only adding to his performance was that he was blocking for Brett Hundley for much of the season, who held the ball on average for 3.01 seconds, the third-longest in the league. Elite Stat: Among offensive guards with 170-plus pass-block snaps, Norwell finished second in pass-blocking efficiency at 98.3. 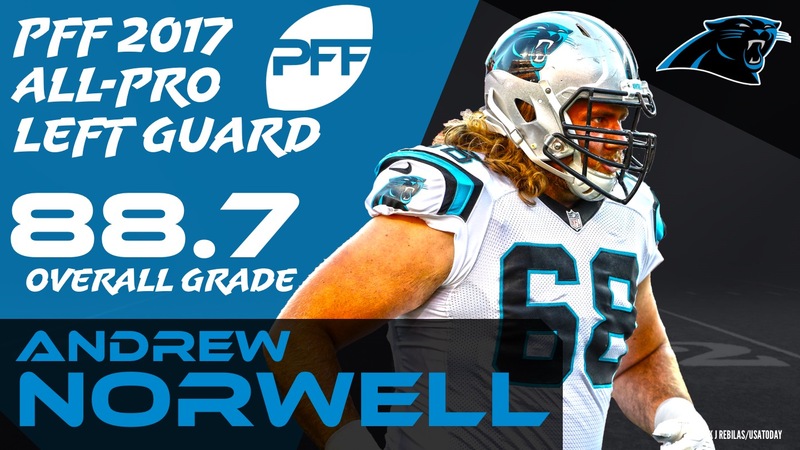 Carolina’s Andrew Norwell has been a top guard for a number of years now, but this was the season he took it up a notch and earned himself a spot on PFF’s All-Pro team with his performances. Norwell didn’t allow a sack or a hit on the quarterback all season long and surrendered just 13 total pressures over a full season of pass protection. He wasn’t just a one-trick pony either, bringing impressive run-blocking grades into the bargain (83.5 run-blocking grade, ninth-best among guards). His 90.7 pass-blocking grade led all guards and was one of the standout pass-blocking performances of the season at any position. Elite Stat: Kelce earned a positive grade on 24.88 percent of his run-block snaps in 2017, the highest percentage for all centers. Philadelphia’s Jason Kelce was so far out ahead of the pack as a run-blocker it’s scarcely believable, and his turnaround in form was a huge reason his team has been so successful. 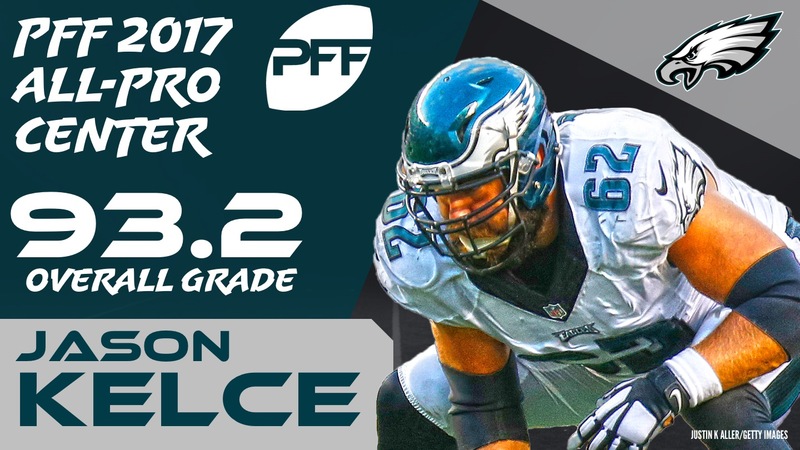 Kelce ended the year with a PFF run-blocking grade of 97.9, dropping below 98.0 only on the final reviews of the year, and that is not only the highest mark of the year at the position, but the highest mark we have ever given a center by some considerable distance. Kelce’s pass-blocking was relatively pedestrian, but because centers have so few genuine action plays in pass protection – typically used as help rather than left to block one-on-one – we felt that it wasn’t enough to overcome such phenomenal performance as a run-blocker. 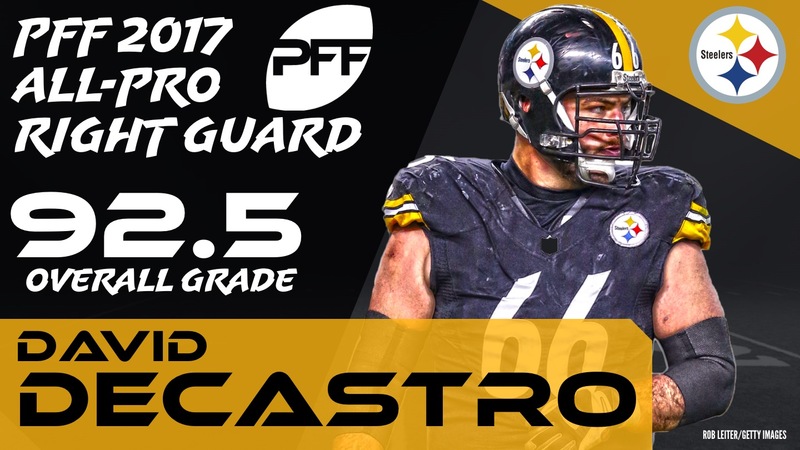 Elite Stat: DeCastro ranked No. 3 in pass-blocking efficiency among guards with 170-plus pass-block snaps in 2017, allowing just 15 total pressures (14 hurries, one hit) on 589 pass-blocking snaps. David DeCastro ended up sneaking a hard-fought battle at the right guard position throughout the season. Both he and Dallas RG Zack Martin have been the standout performers at that spot throughout the year, and neither one ever looked like dropping in form. DeCastro didn’t allow a sack all season, surrendering just 15 total pressures over the year, but it was his run-blocking that truly took a leap forward in 2017. His run-blocking grade ended at 91.9, and that represents a significant jump over his previous career baseline, perhaps finally realizing his true potential as one of the best guards in the game. If much of the All-Pro this year comprises of names that everybody saw coming, one shock appearance is that of Panthers right tackle Daryl Williams. The franchise has been high on Williams for some time, but there was little evidence they were right on that opinion heading into this season, but they were completely vindicated over the course of 2017. 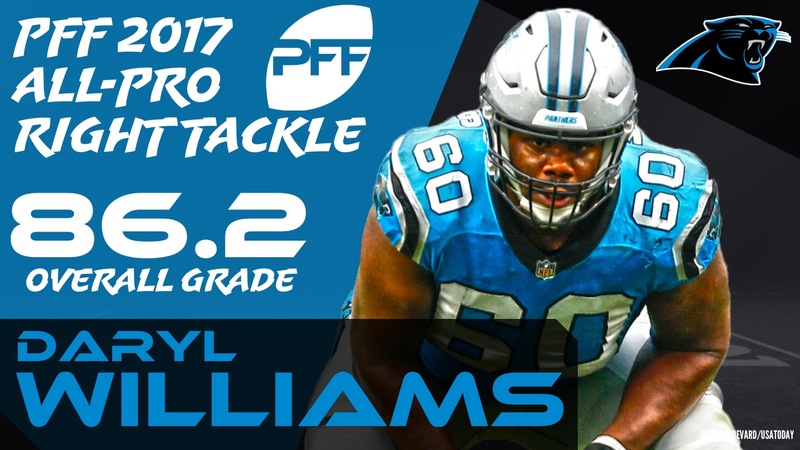 Williams ended up with an overall PFF grade of 86.2, 16 points higher than his previous career-best and a mark that ranks as the best among right tackles in the NFL. He allowed more pressure than some right tackles, but he was rarely beaten quickly or decisively. He also had to deal with his right guard being injured and throwing his inside help into some chaos as the season wore on. Elite Stat: Donald led all interior defenders in 2017, recording 91 QB pressures on 483 pass-rush snaps, despite missing two games. Aaron Donald isn’t just the best interior player in football, but he has a very good case to make as being the best player in the National Football League, period. Donald led the league with 91 total pressures, breaking the 90 barrier almost exclusively reserved for edge defenders. He did this despite being rested for the Week 17 encounter with the 49ers and only playing 14 games over the season. His pass-rushing ability is second to none, including the league’s best edge rushers, and he is a relentless force affecting the quarterback from his interior alignments. 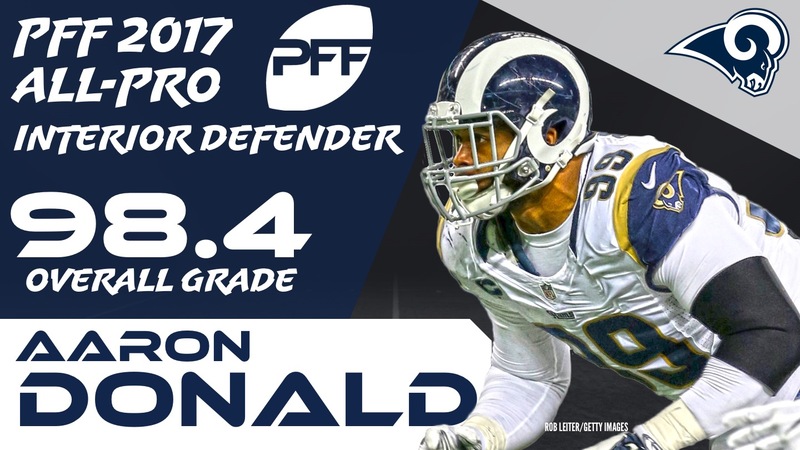 Donald has now posted three straight seasons with an overall PFF grade of 98.0 or higher, breaking the scale of what we thought was possible. Elite Stat: Atkins couldn’t match Donald’s efforts as a pass-rusher, but he still finished second in total pressures among interior defenders with 70. At his best, Geno Atkins was the best interior pass-rusher in the game, but then Aaron Donald and J.J. Watt came along and simply raised the bar. 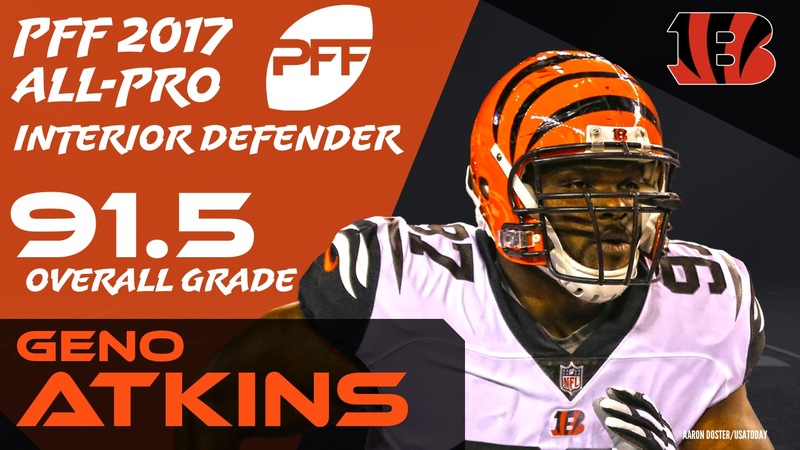 Atkins has never quite gotten back to that 2012 level of dominance he had, but 2017 was his second year of getting close, and that’s good enough to secure him a spot on PFF’s All-Pro team alongside Donald. This gives this team one of the most destructive interior set of pass-rushers you could hope to assemble. Atkins posted 70 total pressures over the season, trailing only Donald among interior defenders, and notched 32 defensive stops. His pass-rush productivity score of 11.8 also trailed only Donald. Elite Stat: Jordan ranked eighth among edge defenders in total pressures with 74 in 2017. 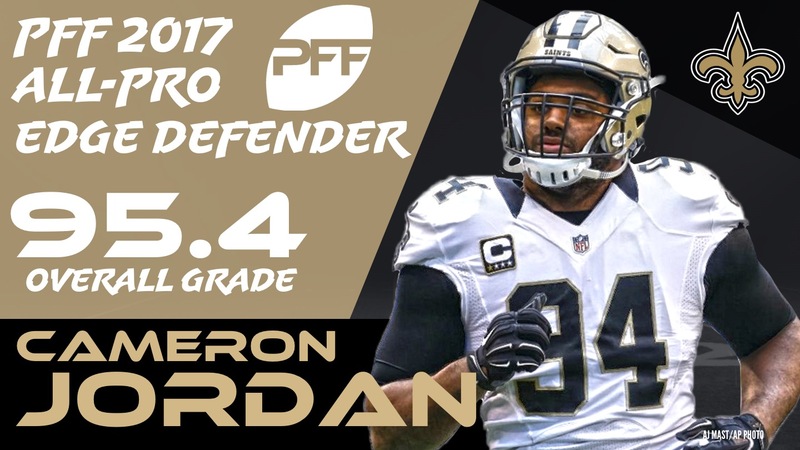 Cameron Jordan may be one of the league’s most underrated players and also may be only getting better as the seasons go by. There were players on the edge with more pressures than Jordan managed this season, as his 74 total pressures ranked eighth, nine pressures short of Von Miller at the top of the list. Jordan added 10 batted passes to his stat line, leading the league for passes deflected at the line of scrimmage. He, of course, is also more than just an edge rusher, and his 91.7 run-defense grade is the third-best mark among edge defenders in the league this year. He has been the most dominant force on a much-improved Saints defense and solidified his status as one of the most dominant defenders in the league, even if he rarely gets mentioned alongside the likes of Von Miller and Khalil Mack. Elite Stat: Miller led all edge defenders in total pressures in 2017, recording 83 over 447 pass-rush snaps. With the Denver Broncos’ season sinking into misery as it wore on, it feels like the league let Von Miller slip out of the limelight, and he received significantly less press this season for the destructive force he continued to be despite never seeing his performances slip. Miller ended the season leading all edge defenders with 83 total pressures and the second-best pass-rush productivity score. 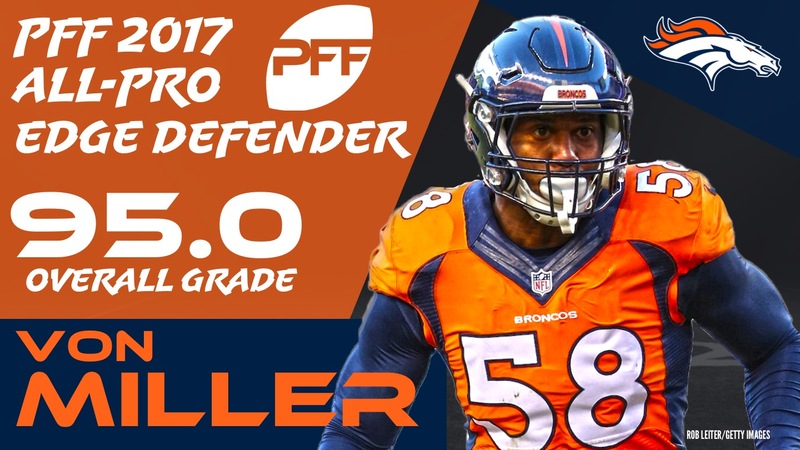 Miller has always been more than just a pass-rusher though, and his 31 run stops are the second-best mark among all edge defenders, trailing only Khalil Mack. Miller’s three missed tackles in the run game were also half the number that Mack missed over the year. Elite Stat: Wagner missed just three total tackles in 2017, leading all NFL linebackers with 200-plus snaps in tackling efficiency (44.3). Seattle’s defense was decimated this season by injury. 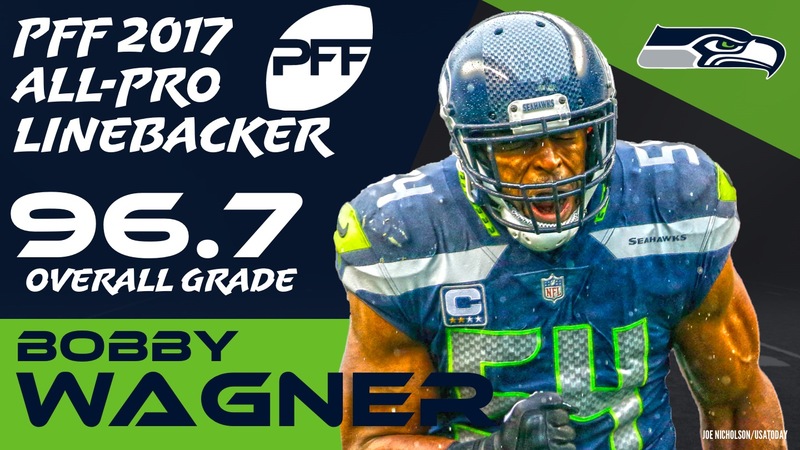 The fabled Legion of Boom lost every founding member at one point this year in the secondary, and Bobby Wagner’s ability to maintain his elite level of play and tie it all together was remarkable. He missed just three tackles all season, and all three of which came in the final games when he had an injured hamstring and was gutting it out to help the team make a playoff push. His ability to read and react to either run or pass is phenomenal, and his overall PFF grade of 96.7 was some way clear of any other linebacker despite being dragged down by those final games playing hurt. Elite Stat: Among linebackers with at least 225 run-defense snaps in 2017, Kuechly ranked him first in run-stop percentage (11.3). Carolina’s defense is just a different animal when Luke Kuechly is out there at linebacker. He is arguably the league’s best coverage linebacker and can get to places and influence throws that most linebackers simply can’t. The combination of his inherent athletic talent with a clear influence of tape study and play recognition makes everybody else’s job easier because they have to defend less space. He allowed a passer rating of just 73.5 when targeted this season, the best mark among starting linebackers and more than 30 points better than the league average among linebackers. Elite Stat: Among cornerbacks with 325 or more snaps in coverage in 2017, Hayward ranked ninth in passer rating allowed (58.6). 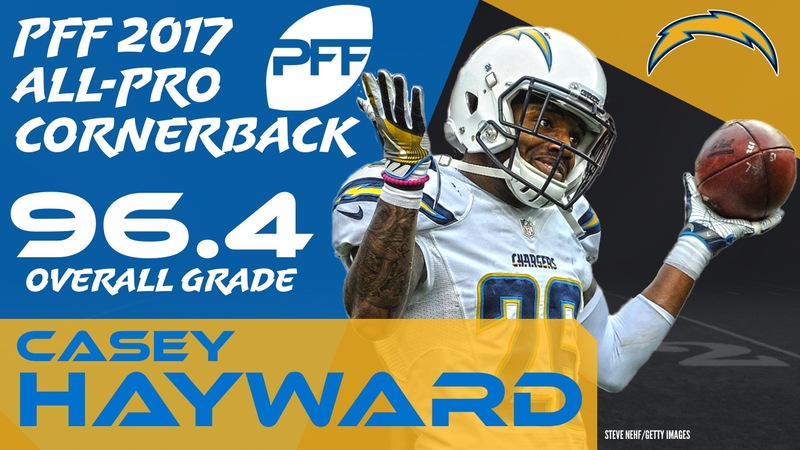 Los Angeles Chargers CB Casey Hayward continues to excel and only push his own ceiling higher over the years. He was signed as merely an addition to a secondary looking to add talent, but the constant injuries to Jason Verrett means Hayward has been the team’s No. 1 cornerback for much of his time with the Chargers. His performance this season against a who’s who of receiving weaponry has been remarkable, and he has been one of the true shutdown forces in the game. 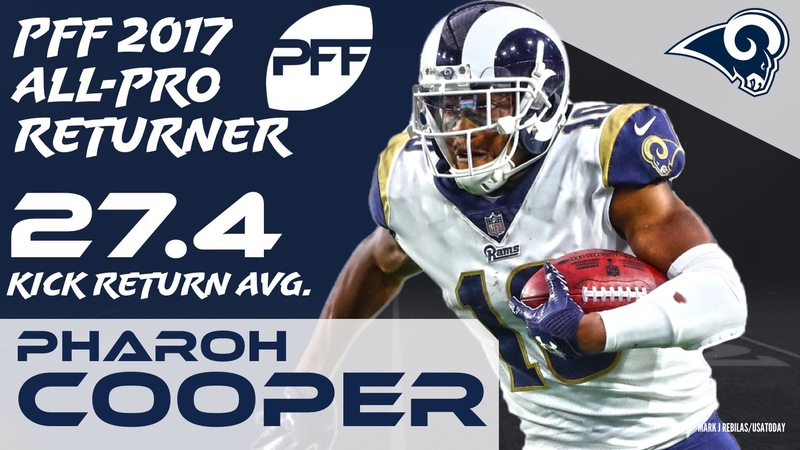 He allowed just 42.7 percent of passes thrown his way to be caught, the best mark in the league among starting cornerbacks, and had 19 combined interceptions and pass breakups, putting him at the sharp end of PFF’s playmaker index. Elite Stat: Ramsey ranked 10th in passer rating allowed (63.9) among cornerbacks with at least 325 coverage snaps in 2017. Jacksonville’s Jalen Ramsey has developed into one of the game’s most fearsome cornerbacks already in just his second year in the league. Ramsey has as much athletic talent as any player in football, and this season we saw him put it all together, with the terrifying prospect that he may not be done developing still hanging over the rest of the league. 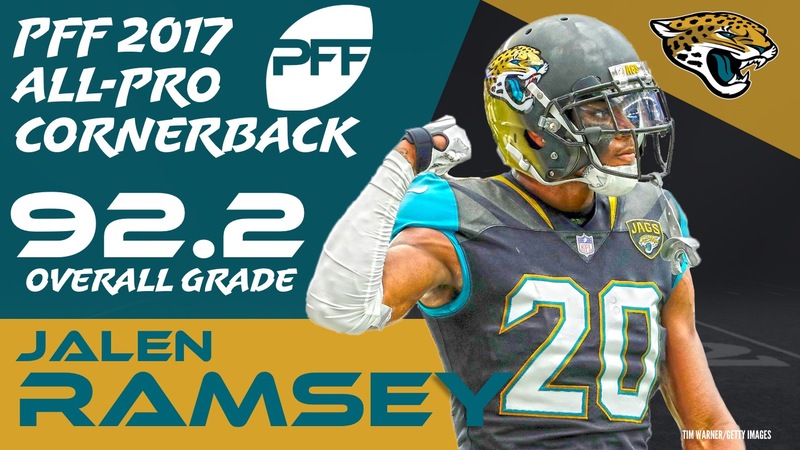 Ramsey’s overall PFF grade of 92.2 was second only to Hayward over the season for a cornerback, and he saved some of his best performances for the toughest opposition he faced. Elite Stat: Missing just five tackles in 2017, Smith ranked fifth among safeties with 240-plus defensive snaps in tackling efficiency (17.2). 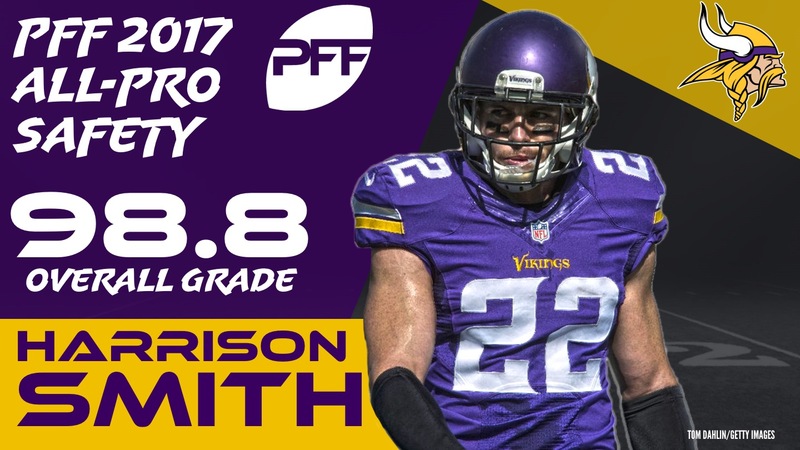 There has been no better player across all positions than Minnesota’s Harrison Smith, who has been the field general for the league’s best defense over the course of the year. Smith’s overall PFF grade of 98.8 was the best mark in the league not only among safeties, but at any position, and is the highest mark we have ever given a safety over 10 years of grading. His ability to play all over the defense for the Vikings – lining up at both free and strong safety on more than a third of his defensive snaps and even covering the slot against both tight ends and receivers – allows that defense to scheme up virtually anything they want, knowing that they have the moveable chess piece to make it happen and get the right players in the right spots. Elite Stat: Among safeties with 30-plus targets in 2017, Amos tied for fourth in yards allowed per snap in coverage (0.47). 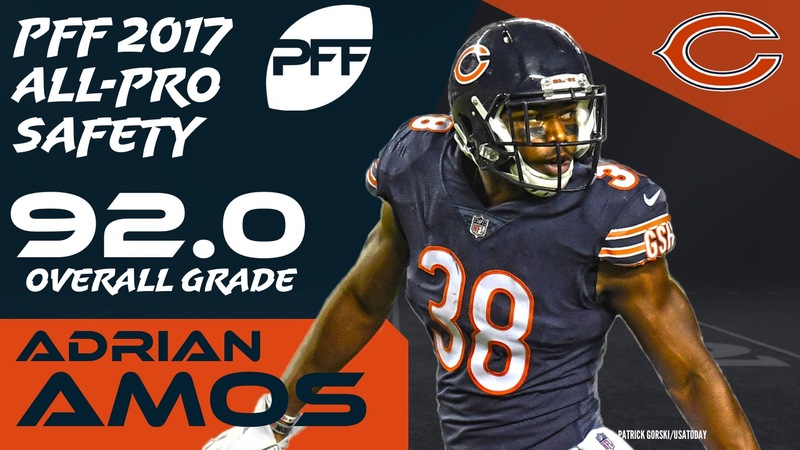 Chicago’s Adrian Amos is seen by many as just another guy, but his ability to simply make the plays you expect a safety to make is not to be underestimated. Safeties by their nature are almost contingency players, coming downhill to add to run fits and adding coverage help on the back end to shore up the cornerbacks. Amos notched 26 defensive stops, just two fewer than Smith managed on almost 300 fewer snaps. He may not make as many splash plays as other players at the position, but he makes all the expected plays without making mistakes. 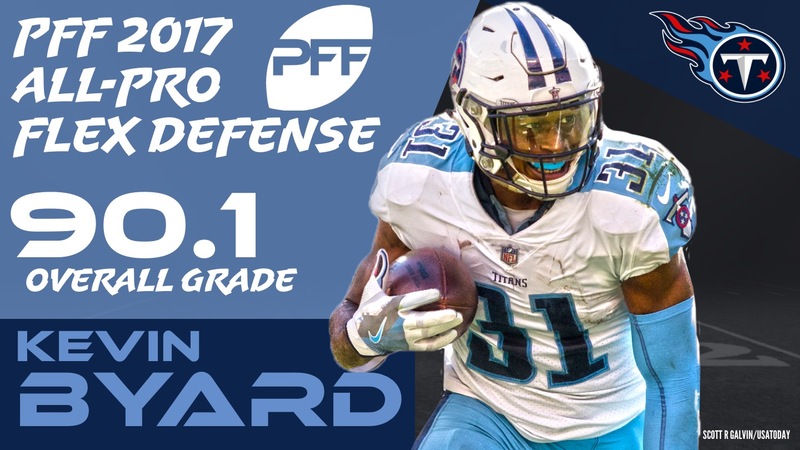 Elite Stat: Byard ranked No. 3 in yards allowed per coverage snap (0.52) among safeties targeted at least 40 times in 2017. Tennessee’s Kevin Byard had a season to remember, snagging a pair of interceptions in the final regular season game to vault himself back to a tie for the league-lead, a position he had held for most of the year. Byard wasn’t just about the interceptions, though. He became a genuine force in coverage for the Titans in their free safety role within the defense. He also has seven pass breakups over the course of the year, a figure that also ties for the league-lead among safeties. In truth, Prater didn’t quite live up to a special first four weeks of the season, but he still finished the year with the highest field goal and extra point grade of any kicker in the NFL. 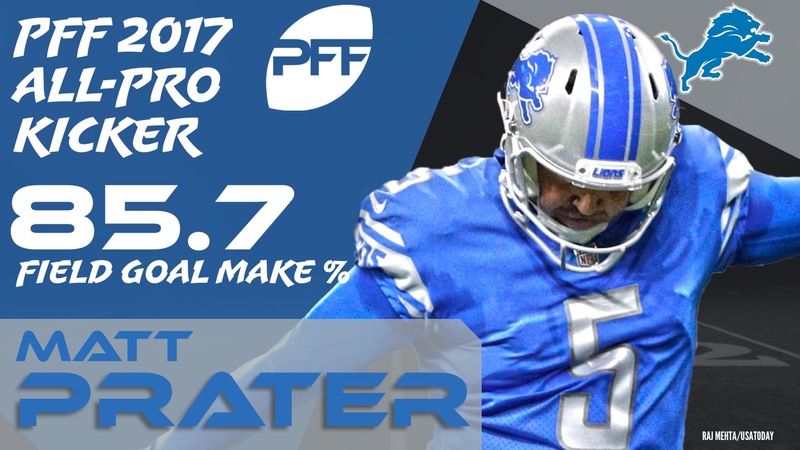 Connecting on 30-of-35 field goals on the season, with all but one of those misses coming from beyond 50 yards, Prater is PFF’s top kicker from the 2017 season. 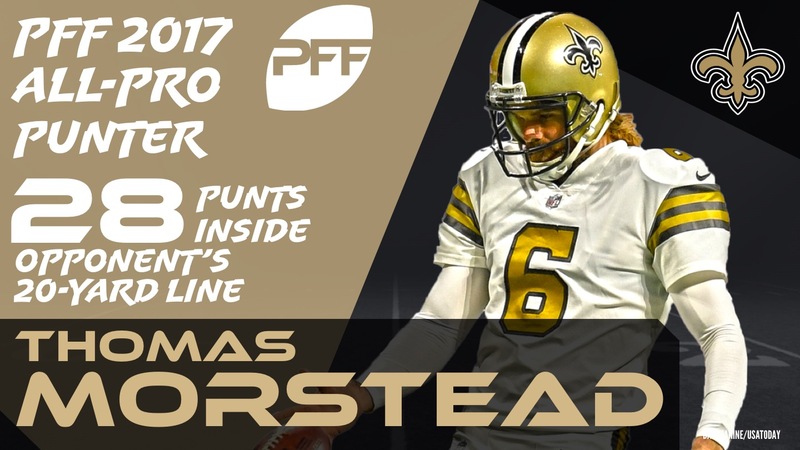 2017 really was a special season for punters in the NFL, but what Thomas Morstead accomplished this year really set the bar. He punted 60 times over the course of the season, with 28 of those punts landing inside the opposing team’s 20-yard line. The Saints’ defensive playmakers and running backs have understandably received a lot of praise this year, but the success of their punting unit has been important for the Saints’ return to the postseason too. The race to be our top returner of 2017 came down to the wire, with Seattle Seahawks WR Tyler Lockett almost stealing the crown with a huge Week 17 performance. In the end, though, Cooper earns the nod, averaging 27.4 yards per kick return and 12.5 yards per punt return. The very definition of the term “special teams ace,” Thomas has been performing at a high level on special teams throughout his career. In 2017, he made 10 tackles and didn’t miss any at all on special teams. 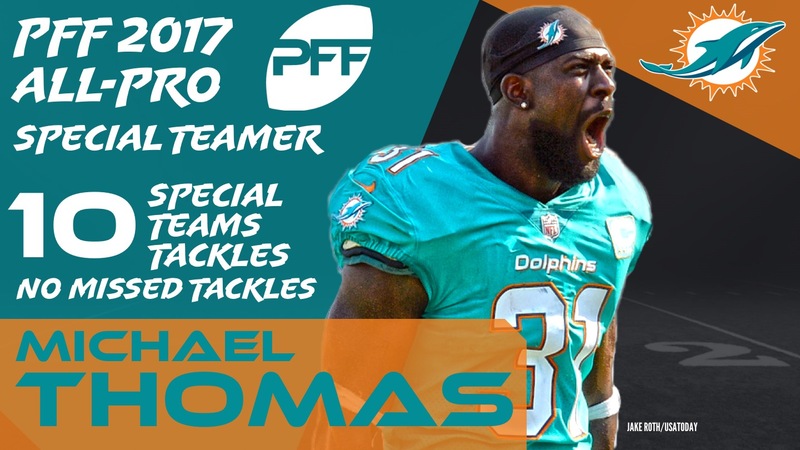 Playing 283 snaps as part of the third phase, Thomas was a member of five of the Dolphins’ six primary special teams units.